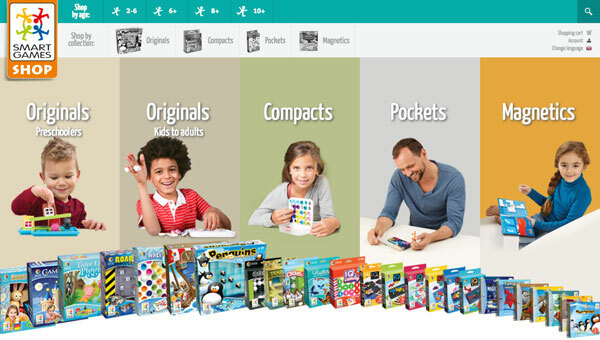 SmartGames launches an online shop! kdb71 published a nice post at her blog "A Mama's Tried and True Picks" about SmartGames & SmartGamesLive! She mentions falling in love with SmartGames while working retail in an educational toys store. Being a mom of three, she enjoys playing our SmartGames together with her children. For Christmas she purchased ColourCode for her youngest, after trying the game online at SmartGamesLive. SmartGamesLive wins Teachers' Choice Award! Indeed, we are very proud that we have won the Learning® Magazine Teachers’ Choice Award for the Family 2015! We are proud to announce that more than 50 000 people have already joined our online SmartGames platform! A big thank you goes out to all of you! Get back to school in style thanks to our new membership program for schools, teachers and students! SmartGamesLive 4 Schools offers fun brain training games for your classroom. Play our puzzlegames on the iPad, tablet or desktop computer - in your class! Coming soon at SmartGamesLive.com: Monsters! On the planet Zork live some voracious monsters. Who will eat and who wil get eaten? Tower Of Logic: sneak preview! Coming soon at SmartGamesLive.com: Tower of Logic! Can you rescue the character trapped inside the burning building?? Your rescue route will take your through both sides of the building but you will only see one side at a time. Challenge your Facebook friends with Mammoths by SmartGames! Mammoths by SmartGames is now available on Facebook! Solve a challenge, invite your friends to beat your score and brag about your victory! Play Mammoths now at SmartGamesLive.com! Keep your brain warm with Mammoths! Mammoths is a logic puzzle on the rocks from the Ice Age. The object of the game is to save ALL mammoths that are trapped inside a cave with ice blocks. A special thanks to our beta testers for their great feedback!